Earth’s atmosphere does many important tasks for us—it shields us from UV radiation, generates weather, and is the very air we breathe. But its ability to keep our planet warm is what makes the atmosphere so important to climate change. * These include methane (CH4), water vapor, nitrous oxide (N2O), and some fluorinated gases. The orange arrows show heat energy (also known as infrared) radiating upward from the Earth. The atmosphere is composed of CO2 and other gases, that form a heat-trapping blanket around the Earth. Since the late 1800s, humans have been burning fossil fuels—coal, oil, and natural gas—to get energy. Burning these fuels, generates tons of extra CO2, which makes the heat-trapping blanket thicker and thicker, warming the planet. Isn’t CO2 part of the air we breathe? Yes, CO2 is a natural part of Earth’s atmosphere. Plants absorb it as they grow (through photosynthesis); humans and other animals exhale it with every breath. The problem is, burning fossil fuels produces billions of tons of excess CO2 every year. These rampant CO2 levels are the root cause of climate change. 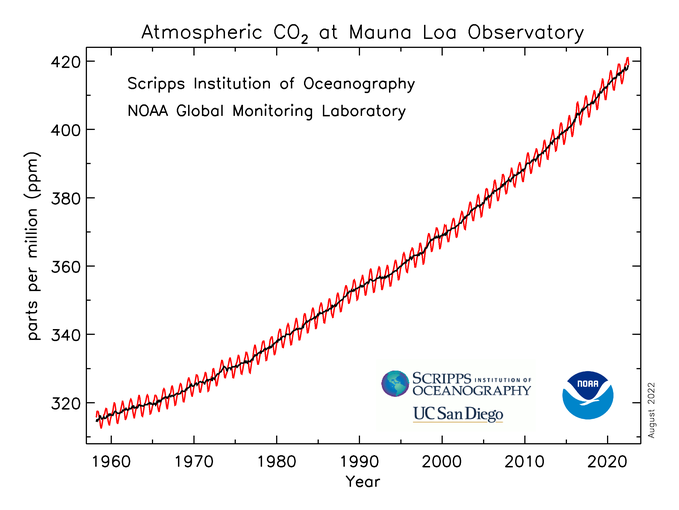 This graph shows the concentration of CO2 in the atmosphere from March 1958 to the present, as measured at Mauna Loa Observatory on the island of Hawai’i. The red line shows the daily measurements, while the black line is an average that smooths out the seasonal fluctuations. Other CO2 observatories around the world show the same trend—CO2 is rising steadily every year as we continue to produce excess CO2 by burning fossil fuels. Why does the red line rise and fall? In a way, this shows the planet breathing. Each year, as summer comes to the northern hemisphere, plants grow faster and absorb more CO2 through photosynthesis, so the red line drops. In winter, there’s less sunshine, so plants absorb less CO2, and the red line climbs to its annual peak. The CO2 data from Mauna Loa Observatory is the world’s longest series of direct CO2 measurements. In 1958, David Keeling from Scripps Institution of Oceanography first set up instruments at the top of this Hawai’ian volcano in the middle of the Pacific. The air there is free of pollution and CO2 production from cities, and the lava rock discourages growth of large plants, which absorb CO2. A Short History of the Keeling Curve (video): Charles Keeling's pioneering carbon dioxide measurements formed the foundation for climate-change research. Monitoring Climate Change (video): What does it take to monitor climate change? Once and Future Climate: Exploratorium physicists Paul Doherty and Stephanie Chasteen play around with the heat-trapping gas carbon dioxide. Our Changing Atmosphere: In this activity, graph carbon dioxide data to see the changes for yourself. Exploratorium’s Wired Pier Environmental Field Station: Look at live CO2 measurements in San Francisco. Carbon dioxide, or CO2, is a natural part of Earth’s atmosphere. But humans produce more of it every year, and that's changing our climate. This graph shows Earth’s CO2 "budget." The top part (above the zero line) shows where CO2 is coming from; the bottom part shows where it goes. The gray part of the graph shows CO2 produced by burning fossil fuels. It has clearly growing over time. Fossil fuels (coal, oil, natural gas) are rich in carbon, and burning them releases the carbon as CO2. So the more fossil fuels we burn, the more CO2 we generate. The orange area shows CO2 generated by land use changes—things like fires and forest removal. Trees, like fossil fuels, are mostly made of carbon, so destroying trees converts that carbon into CO2. Over time this source has stayed about the same. All that extra CO2 has to go somewhere. The systems that absorb CO2—atmosphere, oceans, and land—are called sinks. Most excess CO2 ends up in the atmosphere, the white part of the graph. This has grown over time. Atmospheric CO2 becomes part of the heat-trapping blanket. The ocean also absorbs lots of this CO2. Some dissolves into the water, changing the ocean’s chemistry—a process called ocean acidification. That’s why the blue area is gradually getting larger. Tiny ocean plankton also absorb CO2, and when these organisms die, they fall to the ocean floor taking the carbon with them. On land, plants absorb CO2 during photosynthesis. The yellow part of the graph has expanded a little bit over time, because CO2 stimulates extra plant growth. But there’s a limit to what plants can absorb. Follow the Carbon: This activity lets you model the carbon cycle and its principal reservoirs and flow rates using rice. Dataset How Much Warmer Is It? How Much Warmer Is It? This animation shows where temperatures were warmer or cooler than average, from 1880 through 2017. Yellow, orange, and red mean warmer than average; light to dark blue means cooler than average. Temperatures are compared to the average from 1951–1980. While specific locations may be warmer or cooler from year to year, the overall trend is clear—global temperatures are rising almost everywhere on Earth. They're rising especially fast near the poles. Globally, temperatures have warmed by almost 1 degree Celsius (almost 2 degrees Fahrenheit.) And they're climbing rapidly. As of 2017, the four warmest years ever recorded by NOAA are 2016, 2015, 2017, and 2014. Climate scientists say it’s likely that the planet will continue to warm, by at least twice as much as it has in the last 100 years. How much warmer the planet will get depends largely on how much we reduce on our use of fossil fuels, because that's what’s driving the warming trend. Take a look at temperature projections from global climate models. Not only are temperatures increasing on average, but the hottest days each year are hotter than before. What was once a record high temperature has become just one of many really hot days. On this graph of probable temperatures, the entire curve will shift to the right in the future, which means the average temperature will be hotter than in past years. Also, there will be many more days in the hot or very hot ranges. At the other end, there will fewer cold or very cold days. Even San Francisco, usually cool and foggy, set an all-time record high of 106 degrees in 2017. Carbon dioxide isn’t the only gas that traps heat in the atmosphere and causes climate change. Methane (CH4) is 25 times as good at trapping heat as carbon dioxide (CO2). Carbon dioxide is a much greater concern because we emit so much more of it, but methane accounts for about 20% of global warming. Methane—the “natural gas” often used for cooking and heating homes—comes from natural sources, like decaying plants in wetlands, and human-generated sources like livestock and rice farms. Much like carbon dioxide in the atmosphere, methane levels have skyrocketed since the 1800s—to about four times their previous levels. But the graph above shows that since 1983, that increase hasn’t been steady. From about 1999 to 2007, methane levels held steady. Scientists aren’t totally sure why it stopped rising, or why it suddenly started again. But in general, we know that methane levels are rising in part because we're breeding more and more cattle and other livestock, which make methane as they digest grass. But that definitely doesn’t tell the whole story. These sheep in Australia are wearing devices to collect the methane they breathe out. Sheep, cows, and other livestock have microscopic organisms called archaea (pronounced ark-EE-uh) in their guts that breakdown the carbon rich grass and produce methane. Warming global temperatures may accelerate methane release in the future. Scientists have found that methane is trapped in frozen Arctic soil called permafrost, and is being released as the permafrost melts. Warmer wetlands may also generate more methane. Microbes in the soils—archaea—make methane as they break down plant matter—and as temperatures rise, that process speeds up. Warming wetlands may release more methane, which in turn may cause temperatures to increase faster. The easiest way to reduce methane emissions, according to research, is to stop leaks during extraction of oil and natural gas from the ground. It’s not only wasteful, it adds to the climate burden of this fossil fuel. We could cut methane emissions even more by breeding fewer livestock, but that would also require reducing meat consumption, a much harder task.